(12/14/15) A firsthand experience: The first event the Christmas for Refugee team from the United States attended was in the north of Lebanon to the west of the port city of Tripoli. (There is another city in Libya by that same name that is often in the news because of terror attacks.) Rather than at a church this event was held at rented soccer practice area that is semi-indoors. It is a fenced area with a tin roof that has plastic on the fence during the winter. This Christmas event was slightly larger, about 75 children and lasted five hours from 10:00 AM to 3:00 PM. Because it was further inland than the first event held in Lebanon this year it was much cooler. The area of Lebanon is mostly Muslim but there are some Christian villages including the one visited. Many Syrian Muslim women had registered at churches for aid and as a result a larger number of the children than usual were Muslim despite the fact their parents were told that their children would be told that Jesus was the Son of God born as a sacrificial savior for mankind. 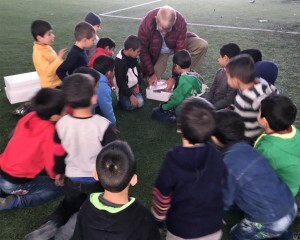 Christmas for Refugee director William Murray helps to pass out meals to one of the smaller groups the children formed by age and gender. Before the meal there were games, songs, a puppet show and meals. 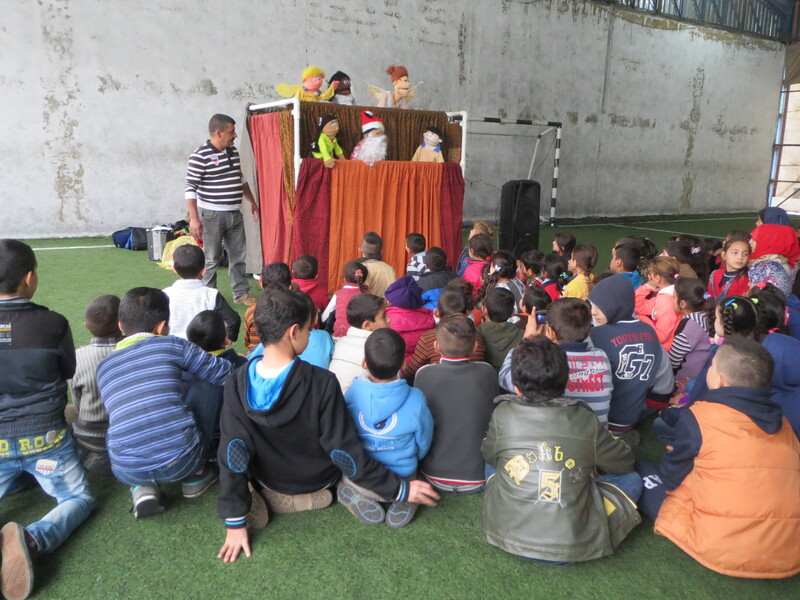 The puppet show used Biblical and current Christmas images to keep the attention of the children while explaining the Gospel story in detail. After the puppet show the children were formed into small groups by age and gender for discussion where they were asked questions about the puppet show and guided into the realization of the divinity of Christ and his role as sacrificial Savior of mankind. There were a total of eleven such events scheduled for Lebanon for the children some much larger than others. Of these events in Lebanon the American team will monitor two. This one before travelling to Jordan and then a second one on a special one-day trip back to Lebanon from Iraq. Reports on the events held in Jordan and Iraq will be posted in the next few days and a longer a summary will appear in January of next year. In all about 4,000 children and their families will be served by the Christmas for refugee program. Help us serve more refugee children. Please donate today!